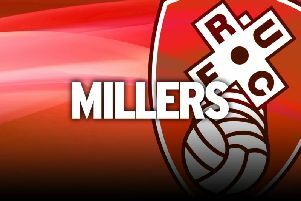 Midfielders Ben Pringle, and Lee Frecklington and winger Kieran Agard, all heroes of last season’s League One promotion-winning campaign, have been the subject of claims they could be on their way out of New York Stadium. But Evans told The Star: “We have all the players we wanted to keep from last season under contract. “There are some players who didn’t play as big a role who we have released or made available for transfer. “There have been bids for some of our players, but they were weeks ago. Agard’s agent, Lee Payne, says his client has turned down the club’s first offer of a new deal. But this isn’t thought to be a major concern for either party. The 24-year-old hit 26 goals last season, and negotiations over an improved deal are at an early stage. Social-media sites have linked Pringle with Brentford and Blackburn and Agard with Leeds, and they claim Frecklington is a target for Sheffield Wednesday and Middlesbrough. Evans has been exasperated this summer by the role some agents have played in transfer speculation. Meanwhile, he has ruled out moves for former loan ace Richard Smallwood and Icelandic winger Johann Berg Gudmundsson. “We made a bid for Richard Smallwood, but that was seven weeks ago,” he said. “It was rejected and we then made other plans, so how can he be on our radar now? The friendly at Livingstsone has been cancelled because the pitch isn’t ready and the match with Queen of the South has now been brought forward to Saturday July 19.